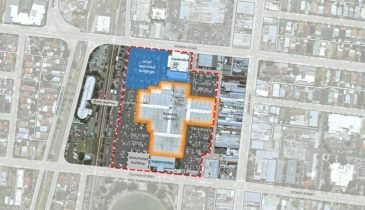 The VPA has been working in partnership with the City of Darebin to undertake a review of the current planning controls and prepare a new planning framework for the Preston Market precinct. In October 2018, the VPA submitted its review of planning controls to the Minister for Planning. The review was informed by extensive community engagement which ran throughout 2018. The VPA is now working with the Council and stakeholders toward the preparation of a structure plan and new planning controls for the precinct. The next stages of the project will be to test draft structure planning ideas with the community before new planning controls are prepared. The new planning controls will then be implemented through a planning scheme amendment process and incorporated into the Darebin Planning Scheme. You can read the outcomes of the earlier phases of community engagement and the final planning review in the supporting documentation library at the bottom of this page. 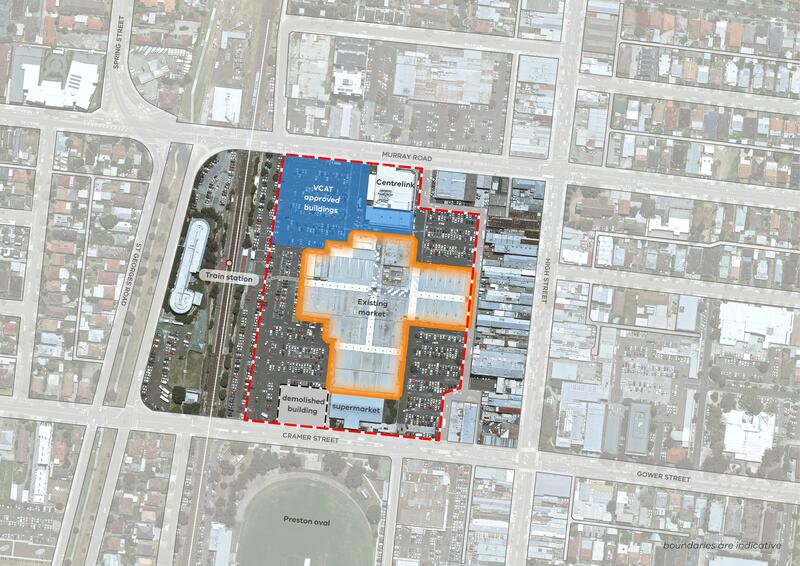 The map below outlines the boundary of the Preston Market precinct, including the existing market building, the buildings approved by VCAT in 2017 and other key features. To download a copy, simply click anywhere on the image. This recommendation was made by the Executive Director, Heritage Victoria and all questions regarding its contents should be directed to the Heritage Council of Victoria. Which organisation is responsible for adding buildings to the Heritage Register of Victoria? The Heritage Council of Victoria, an independent statutory body, decides which places and objects are added to the Heritage Register of Victoria and all enquiries about the register should be directed to the council. What was Heritage Victoria assessing? Heritage Victoria assessed a nomination for the Preston Market to be added to the Victorian Heritage Register, considering the area formerly occupied by Broadhurst Tannery, which was demolished in 1964. How will this recommendation affect planning for Preston Market? The VPA and City of Darebin will consider the contents of the Executive Director’s recommendation when planning for the wider Preston Market site. However, we will await the decision of the Heritage Council of Victoria before making any final planning decisions. I have a question about this recommendation – who do I contact? You can contact the Heritage Council of Victoria. The VPA and City of Darebin are not able to answer questions on the recommendation or report as we did not write it. When will the Heritage Council of Victoria release its findings on whether the Preston Market will be added to the Victorian Heritage register? This depends on whether or not there are submissions to Heritage Victoria’s recommendations. The Heritage Council published the notice of Executive Director’s recommendation on 26 November 2018. Anyone can submit their views about the recommendation within 60 days of the publication. After the 60-day submission period, the Heritage Council will decide whether or not it will conduct a hearing. If no hearing is held, the Heritage Council has 40 days in which to make a determination whether or not to include the place in the Victorian Heritage Register. If the Heritage Council conducts a hearing, it must make a determination whether or not to include the place or object in the register within 90 days of the last day of the hearing. The VPA is responsible for delivering a number of planning projects, including the review of planning controls for the Preston market site. How is the VPA associated with the City of Darebin? The Victorian Planning Authority is leading the review of the planning controls for the Preston Market while partnering with the City of Darebin. What are the current planning controls? The Preston Market site is currently located within the Priority Development Zone, Schedule 1. The Preston Market Incorporated Plan, May 2007 provides the basis for all planning decisions. Office, leisure and entertainment uses at the upper levels of development only, except in Murray Street, Cramer Street and Station Avenue. Who owns and operates the Preston Market? Land within the Preston Market site is predominately owned and operated by Preston Markets Development Pty Ltd, which is a privately owned company. There are additional owners for land on the site of the market who will also be engaged in the process. On 31 July 2017, the Minister for Planning, the Hon. Richard Wynne MP, requested that the VPA partner with Darebin Council to review the current planning controls that apply across the Preston Market site. As part of this review, the VPA and Darebin City Council undertook extensive community engagement activities to understand the community’s views about the site and create a set of guiding principles to underpin the creation of new planning controls. The VPA compared the current controls to key Victorian Government and Darebin City Council planning strategies for the site to ensure the market remained successful for future generations and the site achieved its potential as a vibrant activity centre. What are the boundaries of the site? The subject site is approximately 4.6 hectares, bounded by Murray Road in the north, Cramer Street to the south, the rear of the High Street buildings to the east and the Preston Station car park to the west. What were the key findings of the review? The review found that the existing planning controls do not adequately realise the vision for the site of retaining the character of the existing market, provision of affordable housing or the variety of land uses consistent with an activity centre. New planning controls will need to emphasise the importance of the market, minimise overshadowing of community spaces, promote safe pedestrian areas, environmentally sensitive design outcomes, new cycling and walking paths, integration with High Street and Preston train station, continuous operation of the market during redevelopment of the site and support a range of different land uses, heights and densities. What are the guiding principles the Minister for Planning has approved? What were the key findings of the engagement activities? The community highly values Preston Market for their weekly shopping, and would like this function to continue. The community would like to retain the current essence of the market, particularly the fresh food products, diversity of stalls and small traders. There is potential to incorporate more open spaces and meeting spaces on the site, as well as more market events. The community would like the market to retain its open and airy feel. The community would like fresh food to remain at the core of the site, with opportunities for more activities such as the arts and live music performances. 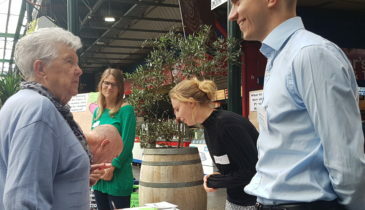 The participants value the market as an inclusive and welcoming place where they can connect to their community. How has the community been involved so far? Throughout 2018, the VPA and City of Darebin run an extensive community engagement process for the planning for Preston Market. The first phase ran from Monday 12 February and concluded on Friday 20 April. Following this, more community engagement run from Monday 9 July and concluded on Friday 3 August. A community reference group was also established and met numerous times within these dates. You can read more about the CRG here. What was the Community Reference Group? The Community Reference Group was comprised of 27 members of the Preston community with an interest in the future of Preston Market. The group attended four meetings, where they learned about planning for the site, discussed their aspirations for the site’s future and heard from technical experts. What do the current planning controls allow? The current temporary planning controls for the market consists of zoning controls and the ‘Preston Market Incorporated Plan’. The plan encourages retention of the existing fresh food market, new high density housing, a plaza area outside the Preston station, a further two plaza areas in Mary Street and other retail areas. The current preferred building heights, which are under review, are 10 storeys for most of the site, 8 storeys for a limited area of the site and single storey for a small portion. The zone allows for planning applications that are consistent with the incorporated plan to be exempt from public notifications and permit decisions cannot be appealed by objectors. Does development on the site mean the market will close? 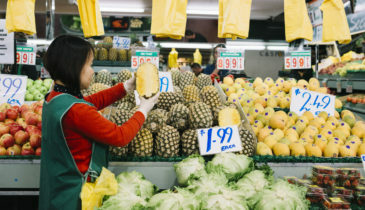 The planning intent is to support the ongoing operation of a ‘fresh food’ market by setting planning policies that will enable landowner(s) to maintain and enhance the viability, vibrancy and distinctiveness of the market. Planning can control the land use and built form of an area where controls apply, and planning can influence infrastructure coordination. However, the application of planning controls will only be applied to planning applications for new uses and development. All new land uses and development requiring a planning permit must meet the requirements of the planning scheme and the conditions of any future planning permit that may be granted. When considering planning applications the Responsible Authority should also consider seriously entertained planning scheme amendments. Planning controls can address issues such as built form, traffic management and waste. However planning controls have limited scope to regulate operational matters or continuation of use. Deliver buildings and works – Planning approves future buildings and works and then it is up to the permit holder to carry out the works. Planning provides parameters for what can occur on the site but cannot demand that this occur. Address commercial matters such as management of a market, leasing agreements, pricing. How will this process deal with non-planning issues? The engagement the VPA is undertaking in partnership with Council has highlighted that the market has multiple values for the community including, but broader than, built form, land use and infrastructure and extending to matters such as tenancy mix, hours of operation, public access over private land, parking management and other matters. In this context, it is clear that planning controls will need to be supplemented by other measures if we are to achieve the best result for the community. The VPA is seeking to work with Council and all stakeholders to move forward on a broad-based platform to protect the market and its community values. Can a heritage overlay ensure that a market is retained on site? 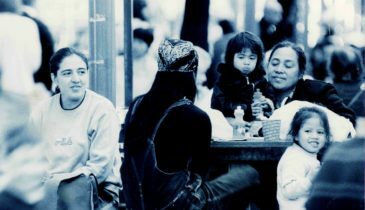 The social and cultural significance of the market is recognised by all stakeholders. However, a heritage overlay cannot ensure a current land use continues into the future and will therefore not ensure that the market continues to operate on the site. Heritage overlays are part of local council planning schemes and include places of local significance as well as places of state significance included in the Victorian Heritage Register. The heritage process leading to the identification of a heritage place needs to clearly justify the significance of the place as a basis for its inclusion in the heritage overlay. Heritage overlays require a planning permit to, demolish an existing building; and/or, to construct a building and construct or carry out buildings and works including alterations. Before a permit can be granted, Councils must consider whether the demolition of the building; or alterations to the existing building; or replacement building, will lessen the significance of the heritage place. Is there more than one owner for the site? Most of the market site is owned by one owner. However there are also other smaller land owners. Are the owners committed to the review process? All landowners have been contacted as part of our engagement process. Positive contributions to the engagement process have been made by all landowners, with a commitment to continue their involvement. Discussions with the landowners are seeking to maximise the opportunities for public benefit and desired community outcomes to be gained through any development that occurs on the site. Will housing be provided on site? Housing is definitely one of the land uses being explored for the site. The intention is to encourage a variety of housing types for a range of households, including some affordable housing. Recently, the Minister for Planning provided guidance to give direction to relevant stakeholders in navigating their way towards a successful affordable housing agreement. The VPA will explore opportunities for entering into a voluntary agreement with the relevant stakeholders and provide mechanisms to support increased levels of affordable housing. Timelines were extended to allow more comprehensive engagement with the community, in consultation with Darebin Council. Specifically, the timelines were extended to increase the amount of open dialogue that is to be undertaken with both organised community groups and individual community members not ordinarily engaged in the planning process. The CRG will participate in a series of exploratory workshops to prepare a ‘vision’ and understand the constraints and opportunities for the site. The CRG will engage in discussions to explore future outcomes for the site and provide suggestions about the future planning and design of the Preston Market site. The VPA will consider these outcomes alongside the broader community engagement and technical inputs in preparing their recommendation for future planning controls. The CRG will produce a final report, which will summarise their feedback to inform recommendations about the planning controls for the site. This report will be provided to the Minister unedited alongside VPA’s recommendations. What is the outcome of the CRG process? The CRG will deliver a ‘Vision’ for the market together with principles and priorities to inform the review of planning controls for the site. Can the broader community feed into the CRG? Once the CRG has developed its principles and priorities these will form the basis of engagement with the broader community. The CRG will participate in a series of exploratory workshops to understand the constraints and opportunities for the site. This will be done through expert presentations on urban design, planning policy, transport, open space, community facilities and markets, and focused discussions with technical experts. The VPA and City of Darebin will now prepare new planning controls for the site, while continuing engagement with multiple stakeholders and community members. The new planning controls will undergo a planning scheme amendment process, to be incorporated into the Darebin Planning Scheme.